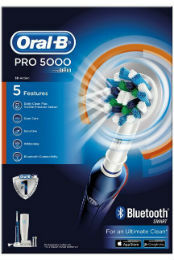 Oral-B Pro 5000 is a mid-range electric powered toothbrush that is especially good for people with sensitive teeth. It is not the best-looking model out there, but it also isn't the type that you will have to hide in your bathroom cabinet. Despite looking like it’s the top-of-the-range toothbrush from Oral-B, the Pro 5000 model isn’t actually their flagship brush. 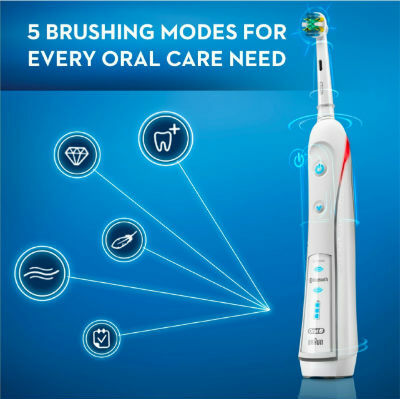 Nor is it the most up to date version, with the Oral-B Smart Series 5000 being their latest version of this model. 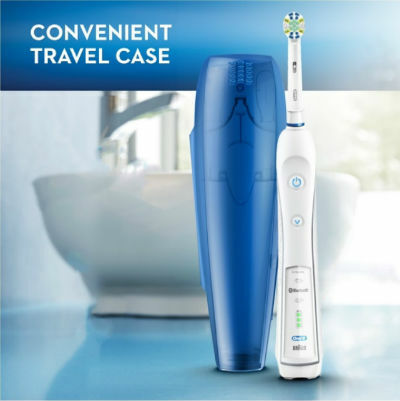 Yet, the Oral-B Pro 5000 is still a popular, high-end electric toothbrush that many people choose to rely on. We put it to the test to see why. 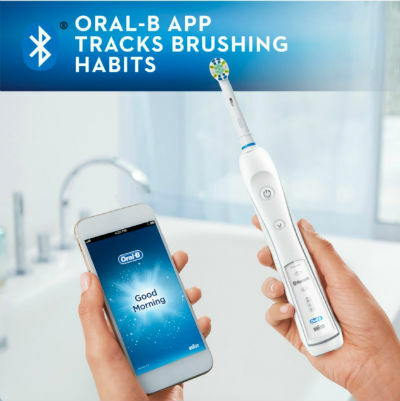 Besides the Bluetooth and app features that we’ll cover in depth below, the Oral-B Pro 5000 comes with a plethora of features for dental hygiene. Firstly, the aesthetics of this model are not the greatest out there. The brush is mostly made of anti-slip rubber coated blue plastic. When compared to the black plastic of some of the other high-end electric brushes, just looks a little bit cheap. Nonetheless, you can still feel some quality in the shape and contours of the brush which fits perfectly in your hand. It’s not bulky, heavy or hard to grip. There are 4 different settings you can use: daily cleaning, gum cleaning, sensitive and whitening. Daily cleaning is exactly what you’d expect, a thorough cleaning with a good oscillating speed that will remove 100% more plaque compared to a standard toothbrush. Daily Cleaning: a usual, 2-minute cycle broken into 30-second intervals for each section of your mouth. Used with the cross action brush head, this is perfect for everyday use. Gum Cleaning: From what we could tell, this simply lengthened the timer so you can get a deeper clean on your gums. Sensitive: Slower oscillations with less angled bristles. Whitening: combined with the 3D white brush head, this really buffs your teeth for a dentist shine. Gum cleaning, sensitive and whitening settings did genuinely feel different when brushing. We are also happy to report that our Dental Dork with sensitive teeth found the sensitive setting to be very effective! If you’ve got dental problems including poor gum health and yellowing teeth, this toothbrush is a good option. The timer worked accurately but seeing as nearly all of our electric toothbrushes come with a timer (even the budget ones) this wasn’t anything ground-breaking. The pressure sensor, however, was something that did impress. On the back of the toothbrush, there’s a small panel that will light up red when you’re pressing down too hard. It’s very useful and doesn’t blind you every time your hand slips. It’s more of a gentle warning. The cleaning action is 40,000 pulsations per minute (8,800 oscillations) which is mid-range. It’s faster than our current number 1 electric toothbrush, the Philips Sonicare 2 Series Plaque Control, but still a hell of a lot slower than the Philips Sonicare DiamondClean, which runs at 62,000 strokes per minute. What really stood out to us as not working was the battery life. Even from the first time we brushed, we didn’t get more than 5 days out of it. Oral-B claim it can last 7 days, but clearly, they are far off. With lots of other mid-range brushes that are cheaper having longer lasting battery life, this is very poor. We also thought that the “one button for everything” was a bit silly. It’s a long slim brush with plenty of room for multiple buttons, so we don’t need to stand there pressing the single button until it turns off. Perhaps this is why the battery runs out so quickly. The charging lead is short but not ridiculous – it was nothing really to talk about. Bear in mind that you will need to use it regularly considering the poor battery life, and there’s no space for it in the travel case. If you’re going away for longer than a weekend, don’t forget to pack it. The storage box for the heads is helpful. Nothing revolutionary – it’s just a box! The Wireless SmartGuide and QuickGuide manuals are always a nice touch. It doesn’t take a genius to work out how to use a toothbrush, but it does not hurt to have a manual handy. For example, if you’re unsure which brushing mode is which, it is useful for finding out. The 3 different brush heads included were: 1 cross action head, 1 3D white head, and 1 sensitive head. If you have sensitive teeth you’ve instantly got a problem – you can only use one of the heads. 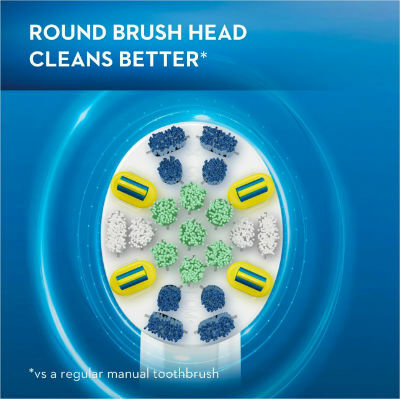 Buying new heads for any Oral-B brush is quite an expense and the lack of heads included in the box really doesn’t help. Any Oral-B brush head should fit. Whether cheaper, mock Oral-B heads will fit is really down to their quality. Don’t expect a high-quality, clean feeling if you’re not going to use the genuine brush heads. This is a gimmick, plain and simple. The Bluetooth and app combo simply record your tooth brushing habits. So, across the Dental Dorks team, we had multiple sets of identical data. 2x brushes per day, one in the morning and one in the evening. Every single one of us brushed for exactly 2 minutes, as we all used the timer. And gradually we noticed that our data showed we were pressing less while brushing, due to the pressure sensor. So really, what is the point of having these dental records? Unless your sensor or timer broke and you needed to monitor your actions via the app, what is the point of this? Besides draining the battery further (the toothbrush itself can hold some data for a few days if you’re not near your phone), we could see no real use for the Bluetooth and app. The novelty wears off very quickly. The first time we used the brush we were impressed with the clean feel, the difference between settings and the data-recording app. 2 weeks later, and only the clean feeling and different settings were impressing us. The battery life and app had us feeling that we’d been scammed! For a top of the range toothbrush with a hefty price tag, this was just not worth what we paid. But we don’t want to put you off Oral-B electric brushes, as some models in their range are genuinely good! 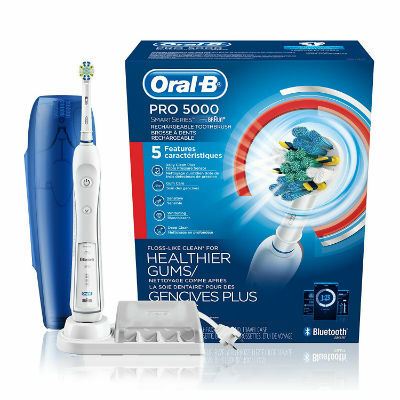 Take a look at our Oral-B Pro 6000 model review, or try the newer version of the Pro 5000, called the Oral-B Smart Series 5000. Overall, we decided we would not use this Oral-B Pro 5000 toothbrush again. Once the battery life has dropped to below a day or two (which by out estimates will only take a few months) we would replace it with a better Oral-B model, which may be more expensive but will definitely be better value for money.